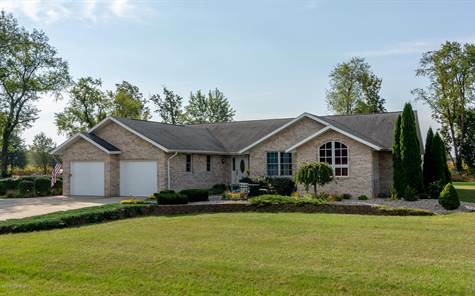 Motivated Seller has reduced the price $5,000 on this Brick ranch home built on 2.8 acres in 2004 features approx 2,200 sq ft. Nice open concept, w/ vaulted ceilings. Two car attached garage enters into mud room area, which features a 1/2 BA, & main floor laundry. Kitchen is spacious w/ walk-in pantry, snack bar, lots of cabinets & counter space. All appliances stay w/ the house. Wood floors in dining area, living room & entrance way. Snuggle by the gas fireplace in living room. Large main floor Master BR w/ vaulted ceilings, large walk-in closet. Master BA has soaking tub, & separate shower. Two additional BRs complete the main level. Basement has a room that is used as 4th BR. Additional space can be finished as you wish. Side yard is fenced for pets. Wrap around deck is accessible from Master BR or LR. A/C new 2018, Furnace new 2017. Call Debbie Floor at 269-362-2599 to schedule your private showing of this wonderful country home.